This sidra spells out the details of many of the Jewish dietary laws. It is clear from the relevant verses that every aspect of kashrut requires close attention. Naturally, if one is going to eat meat, the shochet has to be very carefully trained and must be scrupulous and conscientious in the way he carries out his task. Rashi gives an example. 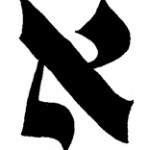 He says that if the scribe leaves out the aleph of emet in the phrase HaShem E-lohechem Emet (“The Lord your God is true”) he might end up by writing met (“dead”) which would be shockingly blasphemous, sinful and highly reprehensible. Look at other Jewish professions and you see the how broadly the duty of care operates. An important example is the shadchan, the matchmaker. Though shadchanim are sometimes – in the hands of writers and caricaturists – mere figures of fun, they have a very great and sacred responsibility. Deciding that two people are right for each other requires scrupulous care. Without it a marriage can be doomed before it starts or destroyed at any point in its history. This entry is filed under Parashah Insights, Sh'mini. WordPress generated this page with 31 queries, in 0.217 seconds.